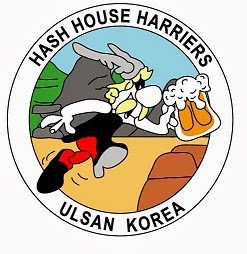 The 473rd Ulsan Hash leaves from outside the Foreigners Compound Clubhouse at 10 am Sunday 23rd April. The Hare for 23rd April will be “Donkey”. Soup shall be provided afterwards by “Lord Nelson”. A Hatrok Hash is planned in Ulsan 20/21st May, with Hashing visiters from Seoul. A weekend of running around the Korean country side and relaxing with a few drinks.